SILVER SPRING, MD – The Montgomery County Planning Department, part of The Maryland-National Capital Park and Planning Commission, and the Office of the Montgomery County Executive presented the findings of the joint Colocation of Public Facilities Study to the Montgomery County Council on Tuesday, October 16, 2018. The Council subsequently adopted a resolution endorsing the findings of the study and recommending the exploration of future opportunities for colocation of public facilities on Tuesday, October 23, 2018. The outcome of a two-year interagency effort, the study establishes a framework for Montgomery County to pursue future colocation opportunities for county agencies. Colocation is the sharing of real estate (land and facilities) and operational services (technology, infrastructure) by two or more organizations and offers many benefits, including resource conservation and operational cost-effectiveness. The Colocation of Public Facilities Study includes an inventory of 165 completed colocation projects and 10 profiles of completed, planned and pilot concepts for colocation projects that informed the findings and help increase awareness of colocation possibilities. Further, the study examined county practices influencing colocation, including site selection, regulatory review, master plans and disposition of surplus properties. 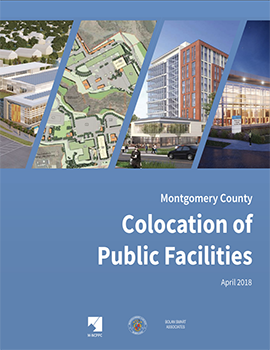 The study recommends new budgetary, administrative and planning actions to facilitate future colocation of public facilities in Montgomery County. Recommendations include synchronizing multiple agencies’ master planning timelines; exploring colocation opportunities earlier in the planning process and evaluating them through the county’s Capital Improvements Program; and promoting private sector support of colocation. The Colocation of Public Facilities Study was completed in April 2018 and presented to the Montgomery County Planning Board in June 2018. The Colocation Study was conducted by the Directors Oversight Committee (DOC), an interagency group of senior-level staff from the Montgomery Planning and Parks Departments, County Executive’s Office, County Council, Montgomery County Department of General Services, Montgomery County Public Schools, Montgomery College, Washington Suburban Sanitary Commission and the Housing Opportunities Commission. The colocation study presentation to the County Council on October 16 was led by Caroline McCarthy and Nick Holdzkom of Montgomery Planning’s Research and Special Projects Division and Ramona Bell-Pearson, former Assistant Chief Administrative Officer for the County Executive’s Office and now the Director of the Office of Community Use of Public Facilities. Bell-Pearson and Montgomery County Planning Director Wright co-led the joint colocation study as the co-leaders of the DOC. The Colocation Study stresses that colocation ultimately is not a goal in itself, but a tool for effective service delivery grounded in mission-driven priorities to best meet the needs of local communities. The Montgomery County Planning Department developed an online map of public facility locations to aid county agencies in identifying sites for potential colocation based on existing resources. For more information about the Colocation of Public Facilities Study, contact Nick Holdzkom at tel. 301-650-5612 or nick.holdzkom@montgomeryplanning.org.